Learn the facts on Car wax! You have two basic choices when it comes to paint protection: carnauba wax or synthetic paint sealant. Here you’ll find information on each so you can choose the paint protection that’s right for you. 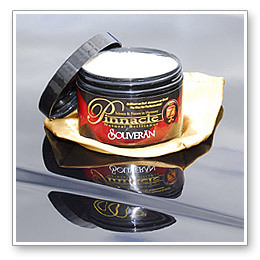 Carnauba wax is the preferred car wax of collectors and concours enthusiasts because it creates a rich, warm glow. It doesn’t appear to sit on the paint. It transforms the paint into a deep, liquid pool that shimmers under changing light conditions. The more carnauba wax, the more shine. Carnauba is rock hard in its natural form. When the leaves of the Tree of Life are harvested, the wax flakes off as the leaves dry out, or they are put into a machine that removes the wax. It comes off in hard flakes. Car Wax makers have to blend the wax with oils, petroleum distillates, or a solvent called naptha (commonly used to thin wood varnishes and paints) in order to make the wax workable. The very best carnauba-based car wax is only about 1/3 natural carnauba. It’s probably for the best since the price gets higher and higher as the concentration of carnauba rises. When a product advertises “pure carnauba car wax” or “100% carnauba car wax”, they are referring to the purity of the carnauba that is in the product, not the product as a whole. One example is Mother’s California Gold Pure Carnauba Paste Wax. Some manufacturers refine the yellow wax again into an ultra-pure white wax to ensure that the wax produces the clearest, most reflective gloss once applied to the paint. Such is the case with Pinnacle Souveran and Pinnacle Signature Series II. As you’ve already read, carnauba protects the leaves of a palm tree from the intense heat and humidity experienced in Brazil. The carnauba car wax repels water and, consequently, most contaminants. When applied to any surface, carnauba retains these characteristics. Therefore, an application of a carnauba-based car wax to your vehicle will protect it from UV rays, heat, moisture, oxidation, and environmental contamination. And it looks like a million bucks! In a nutshell, carnauba car wax is the wax of enthusiasts. It appeals to people who want the absolute most stunning show car shine available and are willing to spend a couple of hours every month or so to get it. Most of them will tell you it is time well spent. Paint sealants are kind of the anti-carnauba. They last a lot longer, they are easy to apply, and there’s nothing natural about them. This is surface science at its best. A paint sealant is made of polymers, which are composed of tens of thousands of synthetic particles that are linked together. When a sealant bonds to your vehicle’s paint, it forms a rigid shell. It is not the warm carnauba that seems to melt into the paint. Paint sealants sit on top of the paint like a transparent chain metal suit. They are glossy and slick, but carnauba lovers will tell you they do not have the warmth and depth of a carnauba. However, the real selling point of a paint sealant is the durability. A premium paint sealant can last 4 to 6 months, sometimes longer. 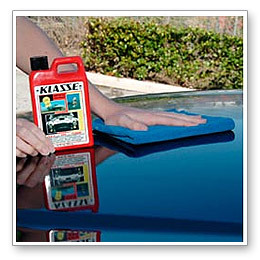 Klasse High Gloss Sealant Glaze, for example, can last up to 12 months. Wolfgang Deep Gloss Paint Sealant 3.0 lasts the more typical 4 to 6 months. By “last”, I mean that water will continue to bead and the paint will remain protected from UV rays and contamination. For people that spend more time driving than detailing, the paint sealant is the way to go. As you’ve seen, there are a lot of differences between paint sealants and natural carnauba waxes. Glassy, hard shell or deep, liquid shine? Six months or six weeks? These are the basic questions you have to answer before selecting your paint protection. However, a growing number of enthusiasts simply refuse to choose. Instead, they coat their vehicles with a layer of sealant for long-lasting protection and then top it with a layer of carnauba for the dazzling shine. Even if you forget to reapply carnauba in 6 weeks, your paint won’t suffer. The Forum Favorite Kit will give a prime example of the shine you can get from a sealant topped with a carnauba. It’s the perfect marriage of beauty and longevity! Remember, paint protection is one of your vehicle’s basic necessities. No matter what kind of product you choose, Autogeek has got your vehicle covered.